When approaching a new project, Bill Stubbs suggests start­ing in one corner of the room and building out the look you want by placing your favorite items in a pleasing and comfort­able mariner throughout the room. He encourages designers to work with a variety of textiles, and he suggests choosing uphol­stery that is pleasing to both the eye and the touch. Fur throws are one of his favorite accessories to give a touch of luxury and softness. He approaches all projects with the same philosophy; regardless of its size or architecture: “A room should be com­fortable, whether it’s built to accommodate eight people or eighty. Interior design is about creating a space unique to the people living in it and encouraging their enjoyment of that space. Having worked as an antiques dealer in his early career, Stubbs appreciates the quality and beauty of antiques and em­phasizes that these timeless treasures add a sense of perma­nence to his design projects. He approaches each project with a certain sense of history, mixing older antique furniture and accent pieces into his designs for new and luxurious interi­ors. This involves anything from a lovely French armoire to a collection of antique clocks, paintings, or books. Stubbs also likes to use these older pieces because they are the ultimate in “green” living and a wonderful way to conserve our resources. He fuses the in practical and comfortable aspects we have come to expect in our homes with the heightened sophistication of Eu­ropean art and antiques. On Wednesday, October 6th, I opened my showroom to visitors of Fort Bend County’s The Grand Soiree (the-grandsoiree.com). We were privileged to have the widely re­nowned legend of design, Hallie Radcliffc-Canalli, speak in my, gallery over lunch. Radcliffe-Canalli is the former presi­dent of ASID. She holds a Master of Fine Arts from the Uni­versity of Notre Dame, where she studied Art History. She is an avid lover of antiques and is well-known for incorporating antique French furniture in her designs. 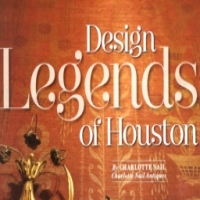 She has been recog­nized by the Houston Antique Dealers Association (HADA) for her unique applications and use of antiques in several of her recent designs. Radcliffe-Canalli’s lecture aimed to inspire her listeners to embrace new ideas and approaches to their home design proj­ects. Her approach to design begins and ends with balance. She stated that the key to her award-winning designs was to in­tegrate a single piece of bold and handsome French furniture into the room and design around that piece to strike a proper balance of “weight” and personality. She likes the look ofcen­turies old French pieces co-existing side by side with newer pieces, as this helps to combine both comfort and elegance to create a sense of relaxed formality. The blend of old and new provides a sense ofpermanence, elegance, and comfort. Listening to these two legends of design, I was struck by how “current” the use of antiques is in today’s designs. Using antiques in your designs is a wonderful way to balance comfort and elegance and set your interior apart from the usual or mundane. Infusing your design projects with elements that cannot be easily copied will serve to create a unique space for you to enjoy for years to come. My personal design philosophy is to collect what really appeals to you and to be guided by your own instincts. Avoid trendy purchases that will go out of fashion rapidly. The clas­sics are always “in style”. It was an exciting week at the Houston Design Center. Thank you to all whomade this event possible, to those who attended, and to these very special legends of Houston design for sharing their creativity and insights.